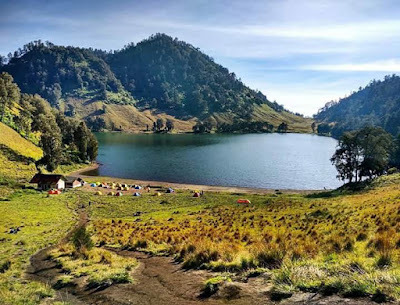 Kumbolo Lake is the most convenience place for Camping in East Java Island, Indonesia have mostly ordered by foreigners and domestic tourist during Mount Semeru hiking package. Kumbolo contain a turquoise blue water surrounded by green hills and amazing Sunrise glows from Kumbolo Lake. In all seasons, many tourists stay 1 night by camping on Kumbolo Lake. However, the New Rules for camping on Kumbolo Lake under Semeru volcano make the visitors more alert to pay attention to the drainage of the Kumbolo area, So as not to bring pollution to Kumbolo lake area on the grounds that there are still some tourists who cannot keep their beauty. The Bromo Tengger Semeru National Park Council (TNBTS) has evaluated the new rules for those who stay by camping at Kumbolo Lake, and imposed new rules last Saturday. Tourists suggested to dig the holes in the ground little bit far from Kumbolo lake for their leftovers of the campsite around Kumbolo, So that the waste can be decomposed naturally. Sukaryo suggested the following, "If you need to wash equipment, take water from the lake using a bottle of mineral water. Don't wash it directly to the water, because it is usually colored with oil that can contaminate the water." Bathroom places around Kumbolo Camping location required to find a place at least 15 meters away from the lakeside, even though the facility is not equipped with running water. Travelers are welcomed to take water from the lake. Prohibited to Swim and bathing around Kumbolo Lake Camping because it has 28 depth with with extreme temperatures due to the temperature at Ranu Kumbolo can not predicted. In 2005, when two couples swam in the Kumbolo lake, they suffered cramps and then sank. They were found dead three days later. "Sukaryo said" Also prohibited to lit the fire around Kumbolo Lake from the camp site carelessly when coming stay by camping at Ranu Kumbolo area to avoid the fire occurance. The existence of the New Rules for Camping on Lake Kumbolo under Semeru volcano to guard this area always seems natural and is free from bad influences that are not wanted. So that all tourists also feel comfortable enjoying the natural scenery by camp. Beside Camping at Kumbolo Lake, We also recognize Camping tour at Mount Bromo have also mostly requested by foreigners to see Mount Bromo Milky Way tour, Sunrise and Sunset. This camping trip package have special function for visitors especially for photographers who have hobby capture the Milky Way, Sunrise and Sunset photography. If You are interested to order the Camping tour at Kumbolo Semeru volcano and Mount Bromo tour package, You must make the tour booking within 2 months before, In Order We can provided your facility enoughly. Detail information about tour package price and tour package facility, You can visit Our Contact.